Temperature due to drop to lows of 1 degrees this week! English weather oscillates wildly but almost always remains within a moderate average. The temperature is continuously shifting. It’s never as clear cut as warm in the summer and cold in the winter in the South of England. In early November we reach low temperatures we find in January, but with highs that we’d find in May. In this country you have to be prepared for all kinds of weather. Don’t go out for the day without a coat in your bag, but always be prepared to have as little as a t-shirt on. We find particularly in Autumn, that it can be warm when the sun is out but very cold as soon as its gone. 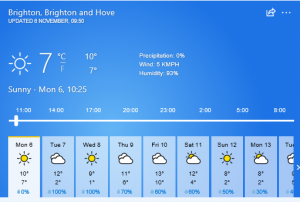 If you are on one of our learn English in Brighton, you’ll already be experiecing the highly discussed weather. Need to adapt your wardrobe? Try taking a trip round Churchill Square and the surrounding areas. You’ll find many mainstream clothing stores, with varying prices. For more Brighton-esque winter gear, take a walk around the Brighton Laines. The Old Laines are just over the road from us, across the Old Steine. Here you’ll find high end retail. The more popular Laines are towards the train station. Here you’ll find both high end retail and budget gear, as well as some quirky shops in between. For an easy win, check out the pre-loved racks on Kensington Street. They have so much clothing at unbeatable prices, great for short term use.